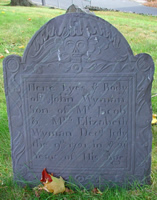 Died Abt 1721 Woburn, Middlesex Co., Mass. Father JACOB WYMAN, b. 4 Jun 1665, Woburn, Middlesex Co., Mass. Mother ELIZABETH RICHARDSON, b. Abt 1672, Woburn, Middlesex Co., Mass.